I have two clivia plants, one the standard, broad-leaved bright orange and another, with narrow leaves and golden yellow flowers which cost a lot more and is less common. If you ‘get into’ clivias you soon discover that there are dozens to collect, most at frightening prices, too much for me at the moment or in the foreseeable future. In spring I collected seeds from my plants, removed from their bright red (or yellow) cherry-like fruits, and sowed them, immediately. Like many amaryllidaceae, they do not store well and are best sown fresh. 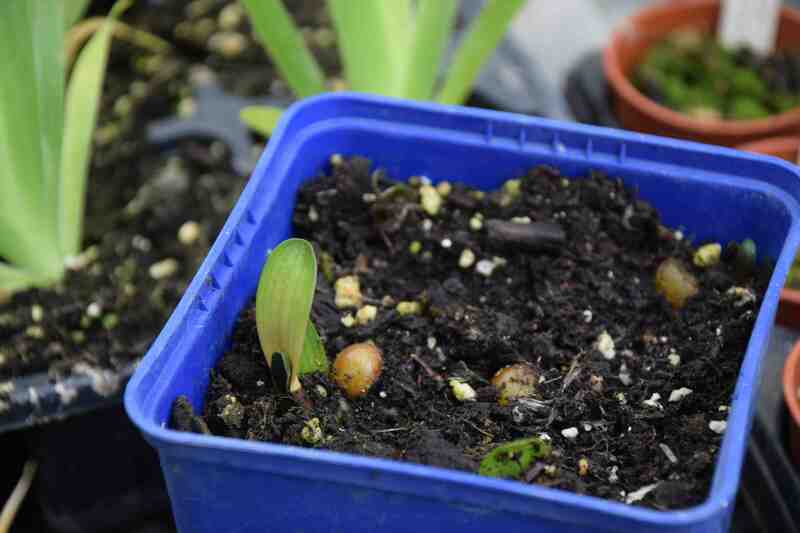 Clivia seeds are best sown on or near the surface of the compost but, with the move to Ireland, they got a bit shaken and disturbed so some were buried. But they started to germinate very quickly. The large seeds are rather odd in that they produce a thick root into the soil first and only later produce foliage, one leaf at first and then a second. I kept the seeds in two pots, about ten seeds of the yellow and more than twice the number of the orange. Curiously, only two seedlings appeared at first in the yellow pot and one was definitely narrow leaved but the other was much broader. Perhaps the two plants had crossed. 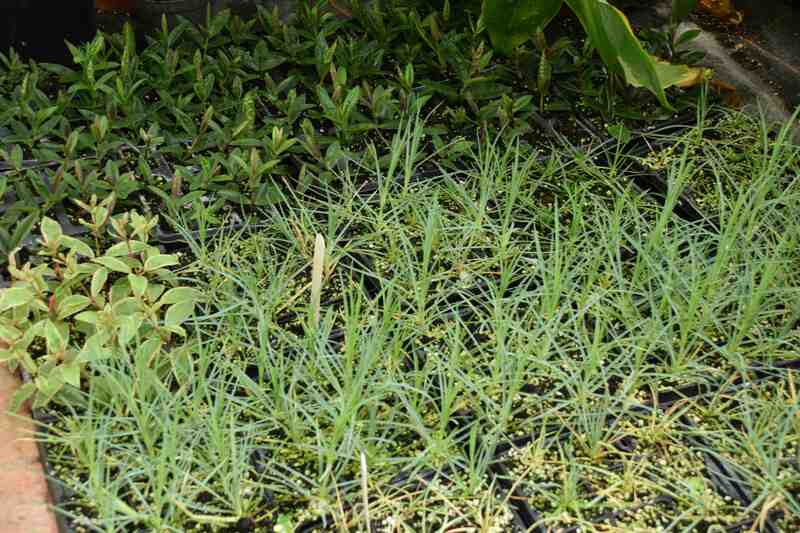 In any case I now have a dozen seedlings carefully potted but I kept the pots of seeds in case more germinate. It will be several years before the plants start to bloom but it will be exciting to see what I get. Clivias are easy to grow and one of the few real flowering houseplants, as opposed to flowering potplants which are disposable. I got my orange clivia about 20 years ago and it gets bigger, with more flowers, every spring. Many people are determined to divide the plants when they offset, something that can be done with care, but I prefer to keep it as a large, multi-flowered clump. and dianthus and hebes to replace old plants that were getting woody. Is there a specific growth cycle to follow? An old gardener said they must always be in deep shade? Under the greenhouse staging? Clivias will survive in shade – I would suggest that keeping them out of direct sun is a good idea because at worst the leaves scorch and at best they turn a rather sickly yellow. I think the key to flowering is a seasonal temperature change, with a cool and dry (ish) winter. In the home, in constant temperatures, they may fail to bloom. I get best flowers when they are in a greenhouse with a cool (5-8c) dry winter or in the conservatory where they are slightly warmer. 🙂 – we both have a few years to wait I am afraid! 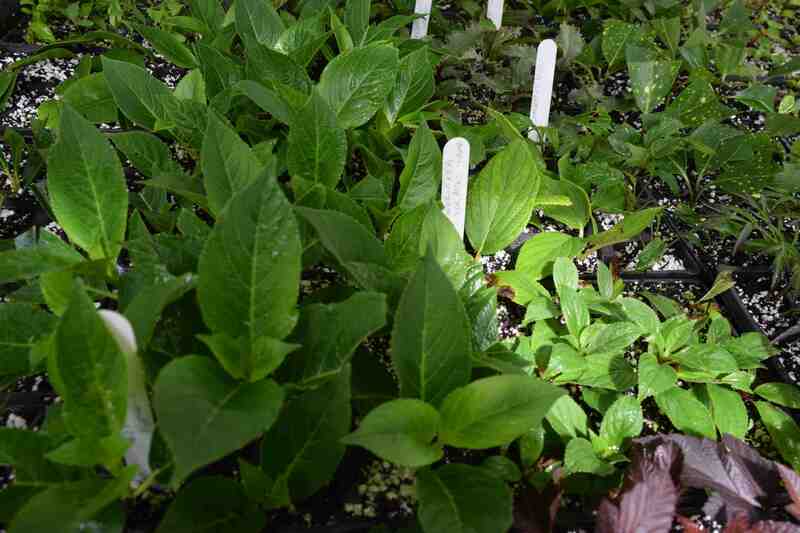 Question of the week – why are my plug plants dying?